Bolon uses the highest quality raw materials, sourced from a supply chain that has been thoroughly audited for their environmentally friendly manufacturing processes. As a result, Bolon has been accredited with Best Practice PVC certification, which assists the process for achieving Green Star rating for projects registered with the Green Building Council Australia. Green Tag rating covers social responsibility, product eco-friendly composition, VOC emissions and durability, while our EPD® (Environmental Product Declaration) communicates BOLON’s transparency about the life-cycle environmental impact. The suppliers of PVC raw materials to Bolon have been accredited with Best Practice PVC certification for the highest environmentally friendly manufacturing processes to produce their materials. The Global GreenTag Product Health Declaration™ PhD recognises progressive manufacturers who fully disclose with 100% transparency the toxicity information of their product. Looking forward requires visionary thinking. A Future Without Footprints is our expression of this, pointing the way forward for Bolon, our partners and customers. Covering seven key areas, it commits us to creating products that respect the environment from several perspectives. examples of product and process innovation at its best. Bolon has a clear sight of where they want to be in the years to come. However, they are determined to ensure that good intentions are backed by concrete action. Only by doing so can they fulfil their commitment to exceed responsibilities and current legal requirements. As well as the obvious environmental benefits in terms of transport and logistics, this also allows us to have full control over production processes. In terms of waste and spill material, we continuously monitor our processes. In turn, this positively affects water and energy consumption. In 2014, our new onsite recycling plant was commissioned. 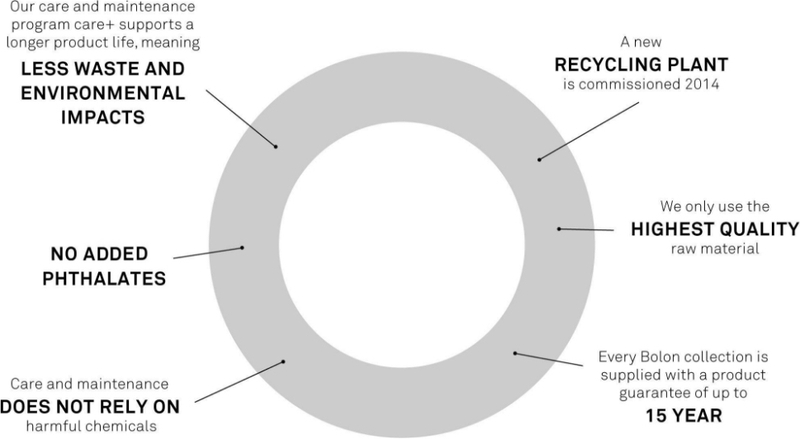 As well as recycling our own waste, we will also recycle waste from other industries. All recycled material produced will be used in backing for our flooring. The backing process our flooring goes through produces fumes. To deal with this, we have installed a filter cleaning system that removes 98% of fumes. Again, this step was taken on our own initiative rather than as a legal requirement. 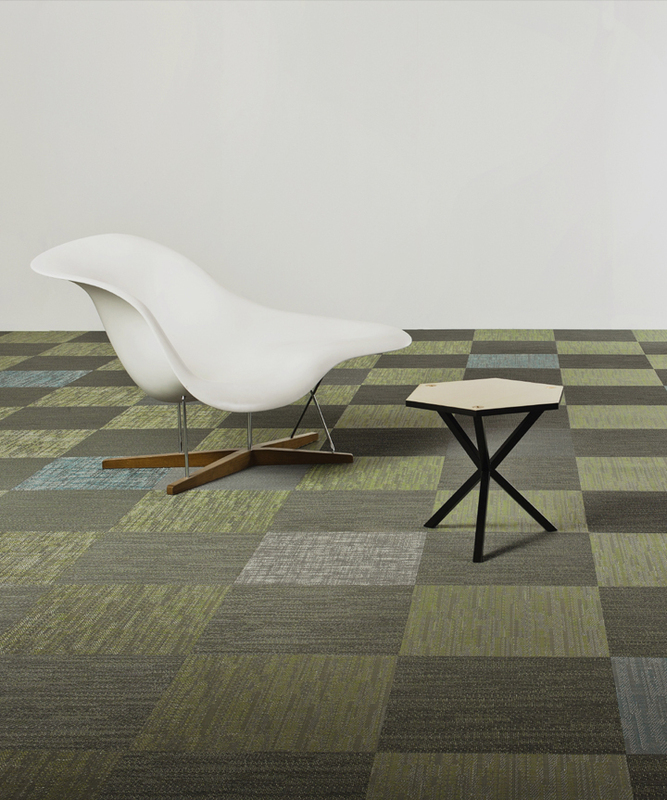 Bolon® Green is much more than a catchy phrase. It describes a holistic approach to our environmental responsibilities and a journey of innovation through a four-stage production process – a journey that starts long before flooring is produced and long after it has fulfilled its intended purpose. Think of Bolon Green as our promise to you. If you show faith in our products, we guarantee that they have been developed and manufactured in accordance with the strictest environmental standards and that they exceed many current legislative requirements. Equipped with this knowledge, you can use Bolon flooring with confidence from both a quality and responsibility perspective. Bolon is committed to using only the safest, most modern raw materials. By doing so, we can be sure that continuous improvement in terms of additives, stabilisers and plasticisers is achieved. The product we are proud to offer has durability Class 33 or 32, can be cared for with ecofriendly, neutral cleaning agents and holds all current Product and Process Certifications. After securing these raw materials, we use manufacturing processes that fulfil the requirements of ISO14000. In this way, meeting goals both long and short term helps us achieve continuous improvement. When our flooring has reached the end of its natural life, ensuring it is handled correctly is of great importance. This is a complex issue made even more complicated by widely varying local legislation, available technology and recycling infrastructure. As a Signatory to the Australian PVC Stewardship Program, we are committed to a long term initiative to recognise and progressively address relevant environmental, health and safety issues associated with the life cycle of PVC. Additionally, through a continuous dialogue with our local partners and by passing on our experience of how we approach this issue in Sweden, we can assist them in identifying correct, safe disposal. Also, on a European level, the Vinyl Plus initiative allows us to monitor recycling processes closely and pass on knowledge globally. We have an A+ to A BREEAM rating, the worlds’ foremost environmental assessment method. All our flooring collections are recommended by The Norwegian Asthma and Allergy Association (NAAF). Our products content declarations, including chemicals, are registered with the flooring industry central database in Sweden.